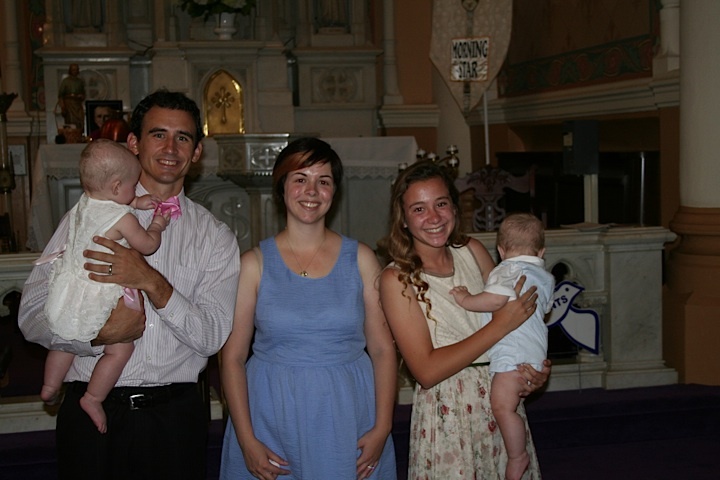 This past week the twins got baptized. 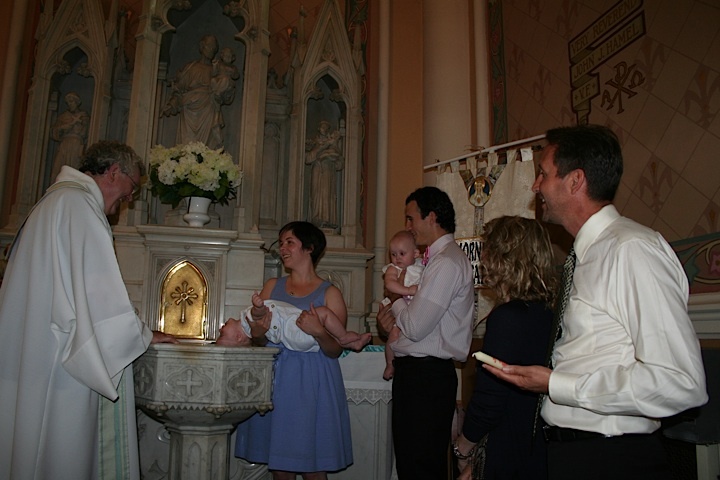 Henry has some fun with the baptismal font; godparents watching from the foreground. 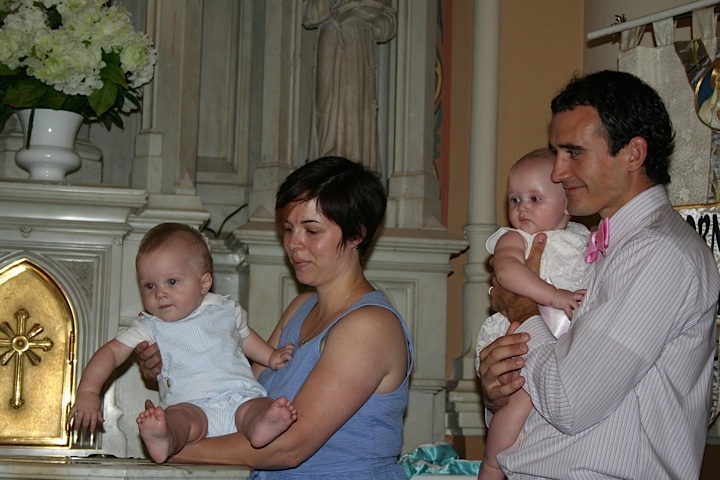 We were waiting for the altar boy to warm the water that was going to get poured on the twins’ heads. There was actually a little bit of a delay, because first the water was too cold, and then – predictably – too warm. The ceremony was nice. 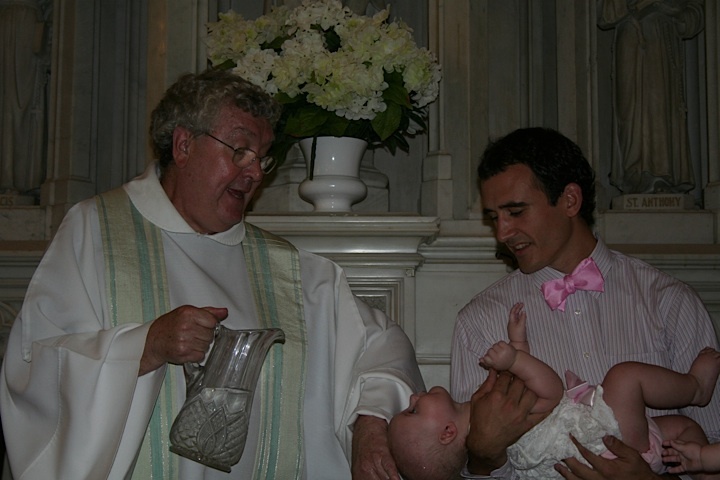 The officiant, Father Greg, is our favorite. He’s kind and generous and embodies all the nice things about religion. First, Fr. Greg quizzed Bob and I on a reading about the parents bringing their children to Jesus to be blessed. I’m sure we did terribly because neither one of us listened very closely, as we were corralling the twins. Bob not knowing the answer (and Eleanor not caring what the answer is). 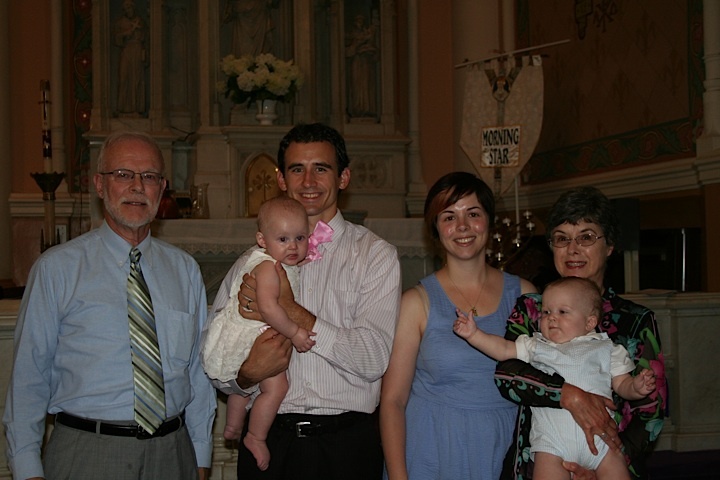 Then we had some blessings said over us and all of our family, and then we all gathered around the baptismal font. One of the lovely things about Fr. Greg is that he crowded everyone who attended up around the font. It was behind the altar rail and raised up several steps (on the same level as the altar itself), a tradition designed to show how holy such a place must be. He brought around one of the chairs that the officiants of mass sit in for Bob’s grandmother to sit on. 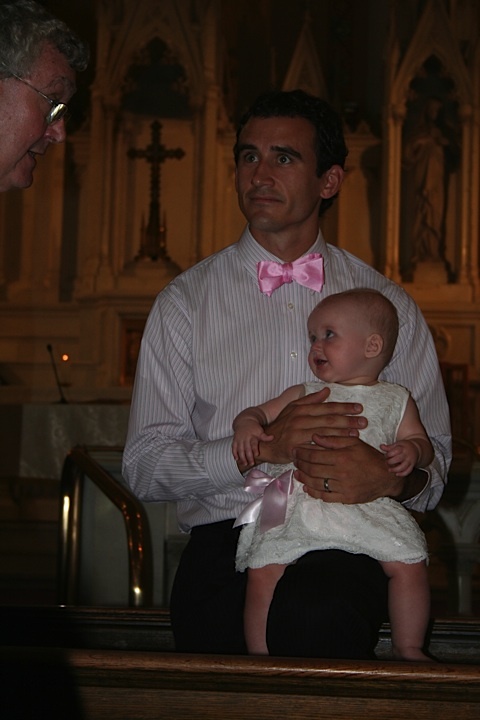 He directed much of his explanation of the ceremony and the meaning behind it to our three-year-old niece, Brynn. He involved everyone. It felt very special – and I’m not particularly religious. 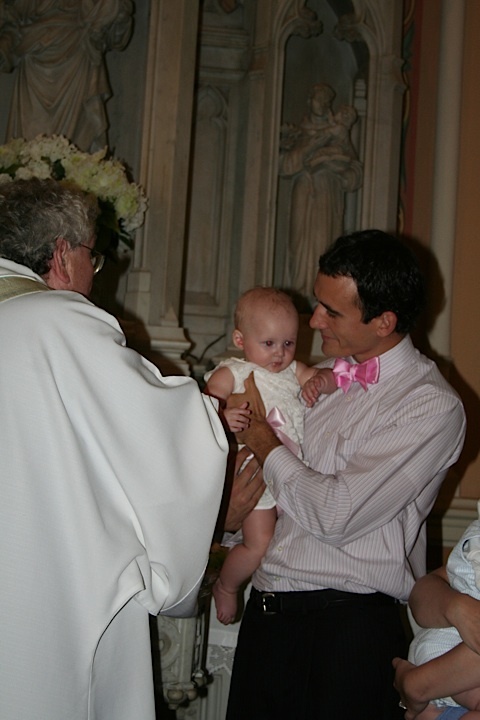 But it was executed with such tenderness it made me feel comfortable bringing my children to that tradition. Henry helped pour the water. 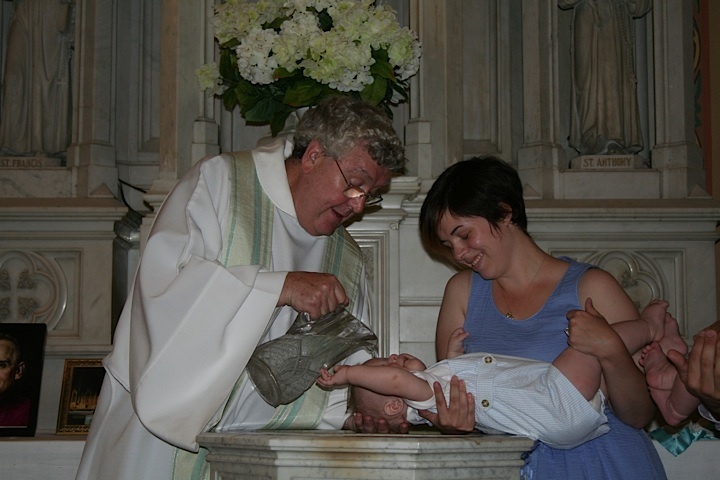 As baby A, Henry was baptized first. The warm water pleases Eleanor. 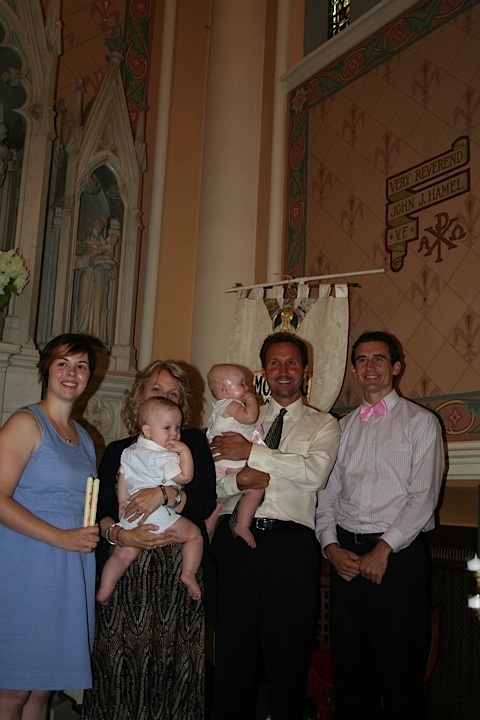 Eleanor was baptized second, and I suspect she wouldn’t have minded being baptized a few times in a row. Looking for more water (excuse Henry’s errant paw). 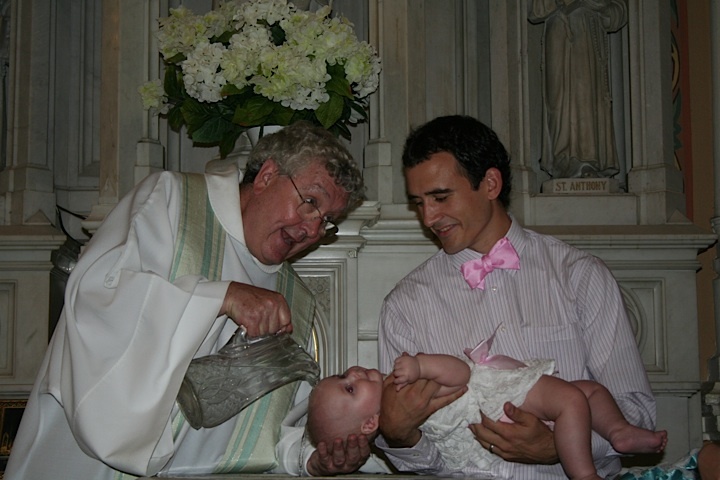 After the main ritual was over and they were officially baptized, Fr. Greg spoke a blessing over the babies, and then over us. 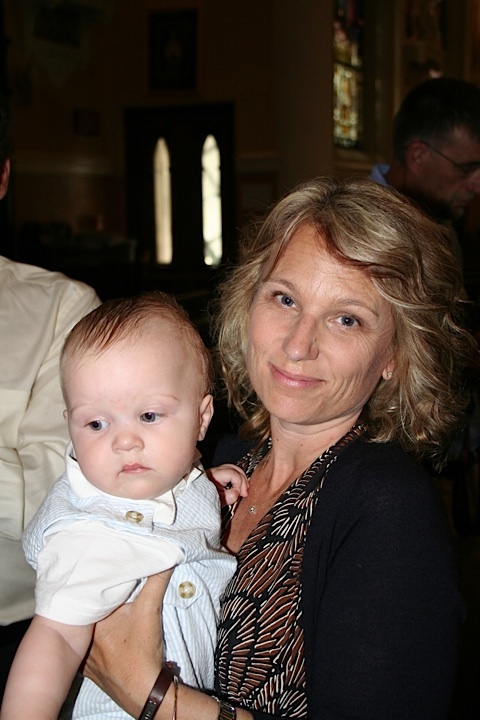 Henry with his godmother, Kathleen. 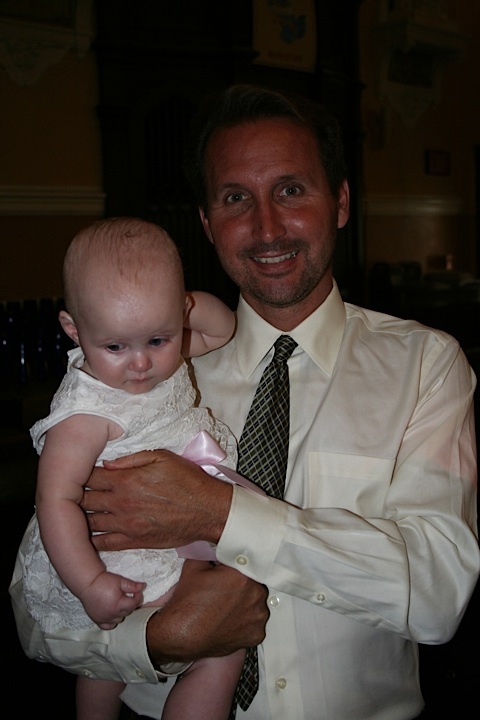 Eleanor with her godfather, Neven. 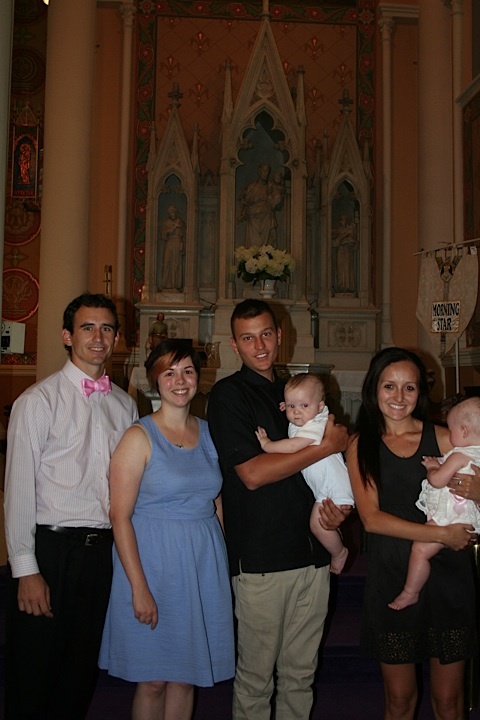 The babies shared godparents, my cousins Kathleen and Neven. Thank you so much to them for coming out to New York to share in this day and to take full legal and financial responsibility for the twins (joking! Mostly!) And thank you to them for the wonderful photos! I took none that day. 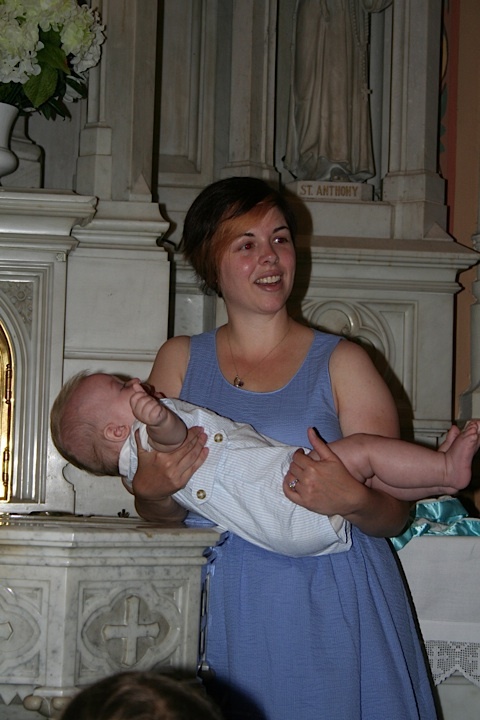 Little man was getting heavy, early on in the ceremony. The four of us, waiting for the water to get warmed (or cooled). Henry’s mohawk is in full force. I should note that the ‘hawk is 100% natural. Little guy only grows hair down the middle of his scalp. Us with Kathleen and Neven. With my cousin Dylan and his girlfriend Ali – I’m so happy they could come! 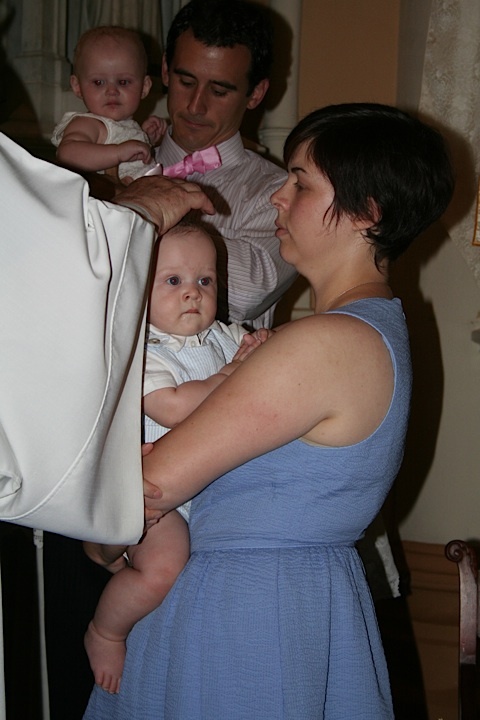 With Sophia, and Eleanor untying Bob’s bow tie. Sophia, Dylan’s sister and my cousin, took many of the photos featured here – if not all of them. 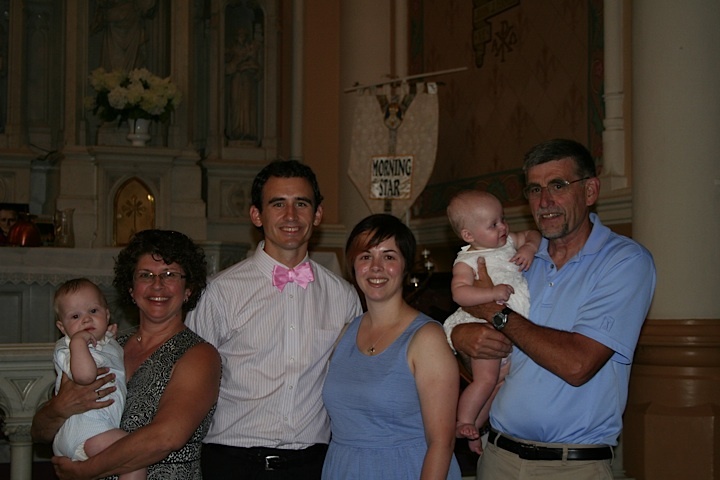 Also in attendance, but not yet represented in photograph form were Bob’s grandmother, Stella, Bob’s sister and brother-in-law, Jen and Tim, and their children, Brynn and Johnny, and Bob’s aunt with her daughter. I was really pleased to see so much family present; it means a lot to us. Thank you everyone!